Hosts make light work of 202-run chase, as Amy Jones's gutsy 94 goes in vain. Coming into the final game of the three-match one-day international series, Mithali Raj had scores of 4, 0, 21, 15 in her last four outings in the 50-over format. But, when her side needed it the most, the Indian skipper brought out her best with a commanding 74* to lead the hosts to a convincing eight-wicket win over England and clinch the series 2-1. 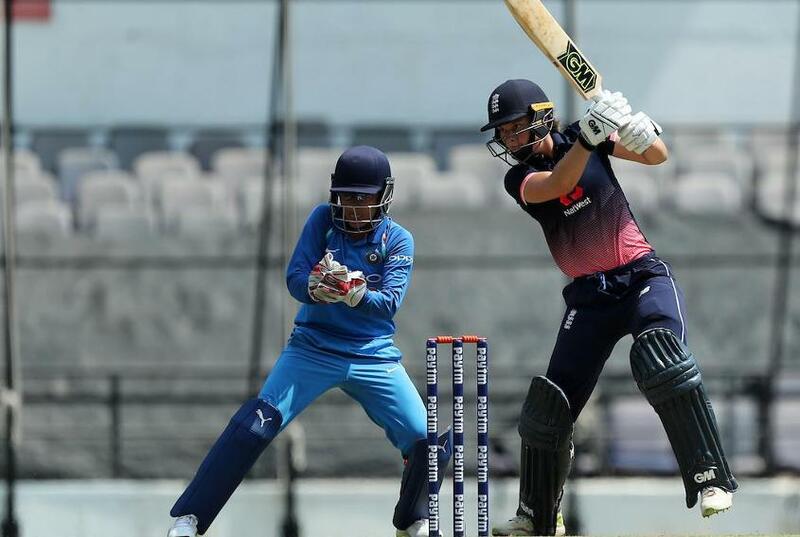 Once the bowlers restricted England to 201/9 in their 50 overs, Smriti Mandhana, Raj and Deepti Sharma all cracked solid half-centuries as India coasted home in 45.2 overs at the Vidarbha Cricket Association stadium in Nagpur on Thursday 12 April. Anya Shrubsole threatened to derail the chase early as she celebrated being named one of the five Wisden Cricketers of the Year in style, getting rid of Jemimah Rodrigues (2) and Veda Krishnamurthy (7) early. While Rodrigues fell edging one to the wicketkeeper in the first over, Krishnamurthy was squared up by an outswinger that found the leading edge of her bat for a simple catch to Fran Wilson at point with the scoreboard reading 23/2 in 6.1 overs. Mithali Raj's record half-century seals the series for India! The fall of wickets didn't bother Mandhana, who brought up her fourth half-century in the last five ODIs. She couldn't carry on for much longer though, with the heat in Nagpur forcing her to retire hurt on a 67-ball 53. With the score 99/2 in 24 overs, the visitors sensed an opportunity, but Deepti denied them by getting into her stride early. She went on the offensive right away, consistently creaming the English bowlers for fours. Mithali, meanwhile, having played second fiddle to Mandhana, opened her shoulders as well and reached a landmark 50th ODI half-century in 92 deliveries. Deepti got to her fifty with a six off Alex Hartley, which also signalled the end of the chase. Mithali finished on an unbeaten 74 in 124 deliveries, with nine fours, while Deepti smoked nine fours and a six during her 61-ball 54. Earlier, batting first, Amy Jones led a spirited show with the bat to help England go past 200. Having not troubled the scorers so far in the series, Jones, coming in at No.3, made up with a career-best 94. Jhulan Goswami got India off to a good start, first getting rid of Tammy Beaumont caught behind for 4 in just the third over of the day and then castling the in-form Danielle Wyatt for 17 with the England scoreboard reading 27/2 after 6.5 overs. Heather Knight, the skipper, and Jones joined forces for a crucial 63-run stand for the third wicket, though the duo consumed 16 overs in doing so. Knight, in a bid to up the scoring rate, tried to take on Deepti, but ended up mistiming the flighted delivery into the hands of Harmanpreet Kaur at long on for 36. Nat Sciver soon followed her back, going back to a quicker delivery off Poonam Yadav only to see the ball thud into her off stump and England found themselves struggling at 99/4 in the 27th over. Jones, however, unfazed by the fall of wickets, held up her end and reached her maiden half-century in ODIs with a cheeky ramp over the wicketkeeper's head. Fran Wilson (11), Georgia Elwiss (11) and Anya Shrubsole (3) all succumbed to the spin of Yadav and Rajeshwari Gayakwad. Danielle Hazell, like she had in the first ODI, stepped up and hit a useful 15 in 22 balls, forging a 38-run stand for the eighth wicket with Jones. Jones had a glorious chance of reaching her maiden ODI ton, but, hampered by a sore hamstring, fell off the last ball of the innings for a gutsy 119-ball 94, her innings laced with seven fours and a six. 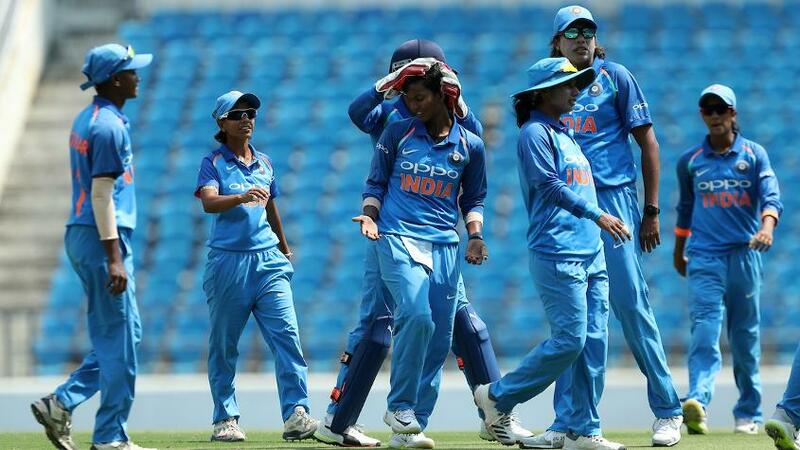 For India, Goswami, Deepti, Gayakwad and Yadav all took two wickets each.